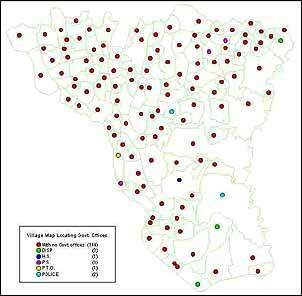 The Implementation of GIS technology in Rural development will help the government. To provide the planners detailed demographic data and education & health related data on desktop in a GIS environment. To assists the planners in finding out the possible locations for the schools and health centres depending on several parameters such as for health; population density, number of health centres required and its optimum location, number of disease infected persons etc. and similarly.